Here we stain background and not cells so after drying there is no water wash step slide is directly observed under oil immersion. In negative staining, heat fixation step is avoided because heat fixation can alter morphological characters. A bacterial cell surface has negative charges. So in this negative staining method, the acid stain which we use has a negative charge on its chromophore group. The negative charges of acidic stain get repelled by the negative charges present on the cell surface.As we know opposite charges get attracted and negative charges repel each other. So here negative charges repel and stain don’t bind to the cell surface and get deposited around the cell. Hence background gets coloured and the cell remains colourless. This method is used to study morphological characters of cell size, shape, and arrangement of bacterial cells. 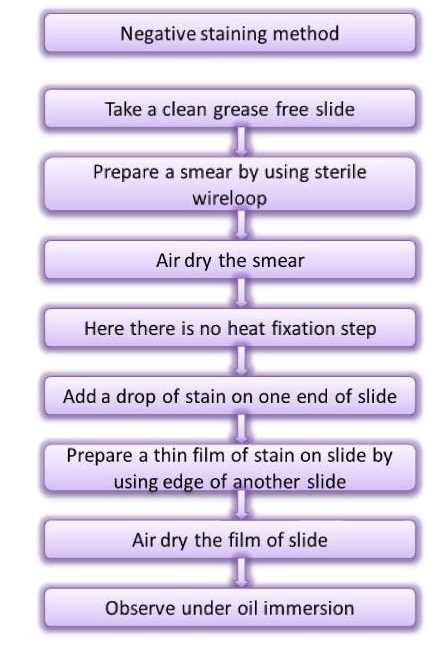 This method is easy and useful in observing the bacteria that are difficult to stain. For example- Spirilli. By using this method we can observe spirochetes.